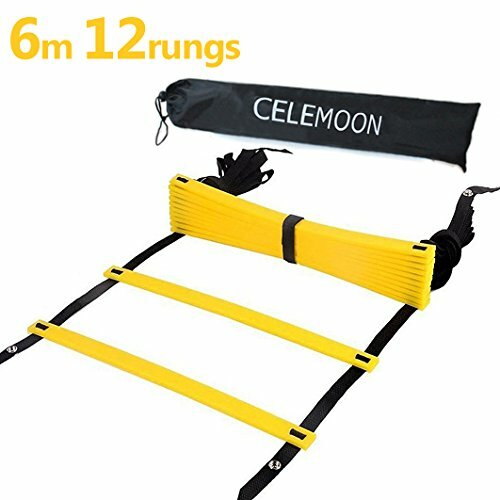 Develop your rapid, precise foot strikes and focus with this CELEMOON 12-Rung Agility Ladder. *Crafted with high quality PP material, designed to last for years. *Offers 15" distance between each rung. *Provides easy placement, set-up and portability. *Includes a carry bag for on-the-go training. *Ideal conditioning tool for all athletes and sports to improve foot speed, lateral quickness, agility, coordination, and overall balance. Enhance your overall endurance, speed and stamina with this CELEMOON Agility Ladder before or after your next workout. - UPGRADED: SAFE PP MATERIALS FOR CHILDREN- Crafted with the NEWEST PP material on the market, the CELEMOON is completely safe and pollution-free for children and adults to use, and can last for years of use and training compare to other standard speed ladder which are brittle and get broken easily. - RUNGS ADJUSTED, READY TO USE - Simply unravel the straps and rungs to set up on surfaces for using. Not like other products that needs to adjust the rungs before fist using, we've already adjusted the distance of rungs so you could use it when received. - CONNECTING SNAP DESIGN - With the snap on the end of the straps, you could easily combine 2 or more speed ladders to make it longer as you want. Never struggle in which length to buy, just conbine them if you need a longer one! - ADJUSTABLE 15" RUNG DISTANCE- Built with a rung distance of 15", each rungs can be moved as you need and for different tranning. Ideal equipment to improve foot speed, movement control, lateral response, coordination, overall balance and general fitness. - VELCRO STRAP & CARRY BAG INCLUDED - It came with a piece of Velcro to secure it all together, and a carry bag to pack it up in seconds and also for ease of carrying, portability and on-the-go training. Large capacity also allow you to put your belongings in it as purse, water bottles, keys etc. If you have any questions about this product by CELEMOON, contact us by completing and submitting the form below. If you are looking for a specif part number, please include it with your message.